Once it comes to growing your business through writings, Your degree of success depends on how hard you try and how many other people you’re competing against (and how hard they’re working). The key to topping Google on a zero budget is writing articles. STEP 1: You’re an expert in your field, yes in that your business products and services you are an expert, so you possess knowledge that other people want. You have what people need, and you got what it takes to sell to them just by writing the importance and benefit of your business services and products to the entire world who are waiting to read your writings. STEP 5: Write Quality Helpful Contents, Good Contents are food to Google, Search Engine Love Eating Good Contents and Always Vomit it as a search result, each time someone request for it from google.com. STEP 6: Publishing For Your Benefits In Growing Your Business, The only condition publishing in other web platform is that they must publish the article with a functioning link to your site. STEP 7: Publish a lot of writings ( Articles ) as possible. E.g., if 300 people publish your article – you get 300 links back to your Business Signature. Q) As Yourself What Should I Write About My Business and Service? A) Write about what you know about your business and services. Make sure your contents are related to your business, products, and services (so you can use the keywords related you your business, products, and services to rank with) and helpful (so it gets published). For example, if you’re a manufacturer of industrial, you might write an article – or series of articles – on how best to handle your products and what benefit the society stands to gain from your manufactured products. Once you get thinking about it, you’ll probably find there are hundreds of articles you could write that are helpful. You may even have some of them partly written already in your instruction manuals or guides, etc. Another good idea is to think of all the questions you get asked by customers and potential customers. These questions show you what people are interested in. Q) How long should my article be? A) The best articles are only as long as they need to be. Keep it short and sweet – there’s nothing wrong with a 400-word article. By the same token, if you need 1500 words to say all you need to say, that’s fine as well. Q) What kind of writing should I use? A) Simply write in a style that your audience will be comfortable with and can easily relate to. but don’t use contractions, don’t end sentences with prepositions, and don’t start sentences with “and” or “but”. But if they’re not old school, just use conversational English. In fact, the more of yourself you include in writing, the best article engaging it will be. The key is to make it readable. Q) Should I focus on keywords? Q) Where should I submit my article? Q) Who will publish my article? A) People publish pre-written articles because they want “eyes on paper”. In other words, they want to generate traffic to their business signature or best they website. Helpful articles are one way of doing that. It also sets them up as credible authorities on a particular subject. No matter what your industry, you’re bound to find quite a few who are interested in what you have to say. In fact, once a few publishers recognize you as a good source of content, they keep coming back looking for more (and even email you asking if you can send them your articles). Q) How will I know when my article has been published? Which notifies you when your article URL has been published on the internet. Google doesn’t pick them all up, but it picks up a lot. Whenever you receive an alert, you make sure the article is unchanged, and the link back to your business signature or site is functioning. Q) Will the publisher change my article? A) No, not. Changing articles is just extra work. In fact, that’s why publishers like good articles and consistent content providers – because that means they don’t have to do any extra work. I’ve had many articles published, and don’t recall a single instance of an article being changed without my permission. If you’re worried about it, you can include an instruction not to change the article in your conditions of publication. Q) Can I get an SEO copywriter to write and submit my articles? A) Yes. Any SEO copywriter should be able to write keyword rich articles and submit them to some high traffic article submit sites. Q) What kind of information would I need to supply an SEO copywriter to write my article? A) You’d need to tell your SEO copywriter something like, “We want to write an article which helps people get to know more about our business and patronize our business products and services. order them to Write a good article, and it always reflects well on your business, no matter where it’s published. Q) How long will it take for my ranking to increase? So don’t expect anything to happen too quickly. But if you’re dedicated, and you’re prepared to write quite a few articles, you’ll see results within a few months. 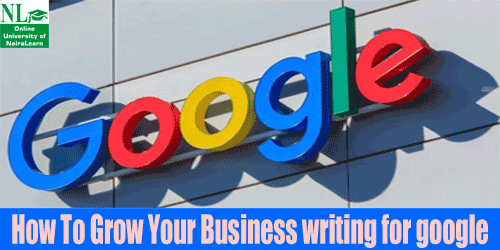 1 responses on "How To Grow Your Business writing for google"